By Karina H. Corrigan; from The Magazine ANTIQUES, June 2004. A single stem of chrysanthemum explodes off the page shown in Plate I. This exquisite Chinese export painting was executed abut 1823, two years after this variety of chrysanthemum, the so-called quilled orange, had been introduced into English gardens.1 Chinese plants were first brought to Europe in the late seventeenth century, but ready access to new varieties of Asian species was not widely feasible until the last years of the eighteenth century. Although he never visited China, Georg Joseph Camel 91661 – 1706), a Moravian Jesuit missionary stationed in the Philippines, collected plants from the Chinese community in Manila to dry and send back to Europe. In honor of Camel’s early efforts on behalf of Asian botanical studies, the Swedish naturalist Carolus Linnaeus 9(1707 – 1778) named the Camellia after him. James Cunningham 9d. 1709? ), a Scottish East India Company surgeon stationed in Amoy in 1698, became the first Western botanist to collect within China. His herbarium is now in the Natural History Museum in London. Discovered by Arab navigators in the fifteenth century, Mauritius was claimed in 1598 by the Dutch, who named it after Maurice or Maurits (1567 – 1625), prince of Nassau. The island served primarily as a stopover on voyages to the East Indies. The effort to establish a permanent settlement was challenging, and the Dutch abandoned Mauritius n 1710. Five years later the French arrived, renaming it Ile de France and importing slaves from East Africa. The French implemented a successful program of cultivating cane sugar, which resisted the persistent wind better than other crops and thrived in the tropical climate. The French continued to occupy this tiny, but strategically important, island until 1810, when they ceded control to the British after the Napoleonic Wars.6 Before his appointment as governor of Mauritius, Farquhar had served as the British resident in Ambon and lieutenant-governor of Penang.7 In 1809 he married Maria Frances Geslip de Latour, whose father, J. Francois Louis de Latour, left France before the Revolution and settled in Madras, India, as a banger and merchant before retiring to Bedfordshire, England. Farquhar shared a fascination for Asian botany with many of his contemporaries. A knowledge of botany was considered an important part of a well-rounded individual’s education in the late eighteenth and early nineteenth centuries. In fact, many East India Company officers were amateur botanists, exchanging specimens, information, and botanical paintings with one another.10 Pressed and dried specimens were preferred for studying plants, but painted botanical studies recorded the three-dimensional appearance of plants while alive. Nathaniel Wallich 91786 – 1815), an East India Company botanist there, are both credited in the catalogues with introducing a number of live specimens from India to the gardens of Mauritius shortly before 1820. Farquhar himself introduced more than sixty species, including Bletia tankervillia, a type of orchid that grows throughout china and was first introduced to Europe in 1798 9see Pl. III). The catalogues also credit Farquhar with introducing species from India, Java, the Cape of Good Hope, and Virginia. Plants have long had symbolic meanings in China that are unfamiliar to Westerners. While Farquhar might have been able to admire the aesthetic beauty of the lotus blossom depicted in Plate II, the Chinese artist who painted it would have also appreciated the lotus as a metaphor for spiritual purity. Rooted in mud, the plant and its blossom emerge from the water unstained. Tiger lilies (see Pl IV) are known in china as the plant that dispels grief. Incorporated frequently in Chinese cooking, they are also used as a painkiller. Hibiscus, a favored plan in ornamental gardens in China during the Song dynasty (960 – 1279), became one of the most widely exported Chinese plants in the nineteenth century (see Pl. VI). The Chinese hibiscus can grow up to thirty feet tall in the tropics, but in the West it is generally cultivated as a small indoor plant or garden shrub. Farquhar introduced at least one variety of hibiscus to Mauritius. Many of the Farquhar gouaches depict plants valued as much for their fruit as their blossoms. The fruit of the Singkwa towel gourd (see Pl. V) is used in Chinese cooking, particularly in soup. In the West the towel gourd is more popularly used as a sponge, or loofah.11 The branch of lime Plate VII shows hanging fruits, flowering buds, and leaves in various stages of growth and decay. The paper-thin blossoms of the poppy plant 9see Pl. X) produce the opium intimately linked to the china trade in the nineteenth century. Cultivated by the Assyrians and the Babylonians as early as the second century B.C., poppies were dispersed throughout Asia and the Mediterranean on Ancient trade routes. During the ninetieth century British and American traders forced Chinese merchants to accept opium derived from the seed pods of the Papaver somniferum plant instead of money as payment for goods. Poppy plantations in India supplied the British, while Americans purchased their opium in Turkey. This flood of opium ultimately led to public outrage and the outbreak of the Opium Wars (1839 – 1842 and 1856 – 1860). Since a number of the Chinese plants illustrated in the Farquhar albums were propagated in Mauritius it is tempting to see the albums as an illustrated appendix to Farquhar’s catalogues of exotics there. The parting gift of the albums to the Farquhars was certainly a reflection of their longstanding interest in botany. However, the albums can perhaps be more accurately defined as exceptional examples of a popular art form produced at a time of fascination with Asian botany. The work of at least three different artists is distinguishable in the paintings, which were executed by unknown Chinese artists working in a Western style. Although a Chinese immigrant community was established on Mauritius by the early nineteenth century,17 it seems more likely that these paintings were executed in Canton 9now Guangzhou), which had a large community of craftsmen catering to Western merchants. Lacquer artists, porcelain enamellers, silversmiths, weavers, embroiderers, and painters created luxurious goods that united their artistic talents with the desires of Western clients. This community of craftsmen grew rapidly after 1756, when an imperial edict decreed that all foreign trade with China be conducted at Canton. Chinese artists who worked around the foreign settlement at Canton learned to adapt the Western technique of painting in oils while continuing to paint in the more traditional gouache on paper or silk. Cheaper and easier to transport than oil paintings, gouaches were produced in large quantities at Canton for export and as souvenirs.19 Views of Canton, Macao, and the Pearl River delta were particularly popular, as were portraits of Chinese figures, illustrations of trades and professions, and botanical paintings. Gouache is composed of ground pigment suspended in water with the addition of gum Arabic and white lead, which saturates the color and makes the medium more opaque.20 Many Chinese export works were painted on English Paper produced for the East India company for use in the high humidity of the tropics.21 However, each gouache in the Farquhar albums is executed on a thin piece of Chinese paper made from the mulberry plant, commonly known as mianlinzhi.22 The front of each sheet was sized before painting. Invisible to the naked eye, this coating appears iridescent when viewed under a microscope and gives the painting greater depth and richness.23 The thin sheets are mounted with a strong hide glue to the album pages, which are a heavier laid paper that also appears to be Chinese. Each of the cardboard album covers is wrapped in Chinese green brocaded silk. Regrettably, a Chinese artist’s shop label, which once adorned the inside cover of each album, was cut out at some point prior to the 1960s. In the rendering shown here, the green stems of the peony are outlined with contrasting lines of red, a technique often found in traditional Chinese botanical painting but rarely used for Western botanical subjects. Craig Clunas notes that the technique of showing the undersides of leaves by employing a paler shade of solid green is an inheritance from the Chinese flower painting tradition.’26 A shiny coat of gum Arabic on the dark green surfaces of the leave further articulates the three-dimensionality of the leaves. 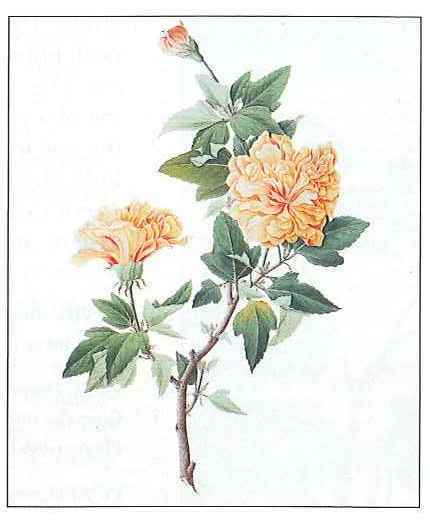 Each of the Farquhar gouaches depicts a single stem on an otherwise blank sheet of paper, a type of rendering more typical of Western botanical studies in the eighteenth and nineteenth centuries than of Chinese studies, which generally include some depiction of the ground in which the plant grows. The gouaches also incorporate European approaches to color, light, and shadow. The albums contained a second painting of a peony (Pl. XIV), which differs from the one in Plate IX only in the placement of the individual leaves and on occasional stem. A comparison of the two pictures offers insight into the techniques of Cantonese artists working for Western patrons. Templates were often used to simplify the creation of these mass-produced works. The outline was traced onto the paper in silverpoint or ink to guide the painter. Outlining in ink is a traditional Chinese technique, whereas Westerners introduced the use of silverpoint for outlines on textiles, wallpapers, and gouaches produced for the export market.27 Many of the Farquhar gouaches reveal traces of these silverpoint outlines (see Pl. XIII). A Gouache of the interior of an artits’s studio offers a tantalizing, if stylized glimpse of the environment in which these paintings may have been executed (Pl. XII). Three Chinese artists work hunched over tables, each holding a brush perpendicular to the page-a typically Chinese practice. One botanical painting and two large paintings of bamboo, all in the Chinese style, hang above the windows looking into the studio. However, most of the paintings on the interior walls are more Western in nature. The objects of many are recognizable to those familiar with typical Chinese export paintings-views of the Praya Grande at Macao and the foreign factories at Canton; portraits of Chinese officials, beauties, and tradesmen; and botanical still lifes. Given the large number of surviving Cantonese paintings and written accounts of the number of painters, the reality of a thriving studio with only three paintings is improbable. These paintings are derived from a well-established system of modular production embodied in so much of Chinese art and culture, from food to calligraphy to architecture.31 The Mustard Seed Garden Manual of Painting (Jieziyuan huazhuan), first published in 1679, contains woodblock prints of all the plant motifs a painter might need. An artist could creatively combine each module in different ways with almost limitless variations.32 Chinese in materials and execution and European in design and patronage, these gouaches are a fusion of Eastern and Western botanical painting traditions. They represent some of the finest aesthetic achievements of the China trade era, and their inks to the island of Mauritius heighten their interest as tangible links to the global trading economy of the early nineteenth century.